To open their seventh NFL season, the Green Bay Packers hosted the Dayton Triangles on September 18, 1927. The Packers had finished fifth in the league with a 7-3-3 record in ‘26 and had newcomers in tailback Red Dunn, formerly of the Cardinals, and end Lavvie Dilweg, who was previously with Milwaukee. Curly Lambeau (pictured at right) was still playing at tailback as well as coaching the team. Dayton was 1-4-1 in league games in 1926 and had a new player-coach in Lou Mahrt. The Triangles had not posted a winning record since 1922 and were 4-23-3 in their last four seasons. Dependent on local talent, they played a disproportionate share of road games and had difficulty competing with the NFL’s better clubs. There were 3600 fans in attendance at City Stadium in Green Bay on a windy day, which had an effect on the kicking game. The Triangles hung tough defensively against the Packers for three quarters and did well with some long passes, although the plays were from their own end of the field and didn’t get them into Green Bay territory. Meanwhile the Packers, typically one of the NFL’s better passing teams, managed only one completion. Dayton threatened twice, but Earl Britton missed a 40-yard field goal attempt and Walter Achiu failed on an attempt from 33 yards. Vern Lewellen did a good job punting under the conditions, outperforming the Dayton kickers and keeping the Triangles on their side of the field. Following Green Bay’s first series of the third quarter, Lewellen punted 70 yards to once again mire the Triangles in their own territory. A punt into the wind by the visitors gave the Packers the ball near midfield and they drove 46 yards to a touchdown carry of one yard by Curly Lambeau. Red Dunn added the extra point. Midway through the fourth quarter, lineman Jug Earp blocked a punt and tackle Tiny Cahoon recovered in Dayton territory. The Packers made a couple of first downs before Lambeau again ran for a TD, this time from seven yards out, and Dunn again successfully converted. The Packers came away winners of the hard-fought contest by a final score of 14-0. Green Bay went on to post a 7-2-1 record, losing twice to the Bears and ending up second to the Giants in the standings. The shutout of the Triangles was the first of five overall as the Packers outscored their opponents by a combined 113 to 43. Dayton, meanwhile, defeated the Frankford Yellow Jackets the next week but didn’t win again, finishing with another losing tally of 1-6-1. 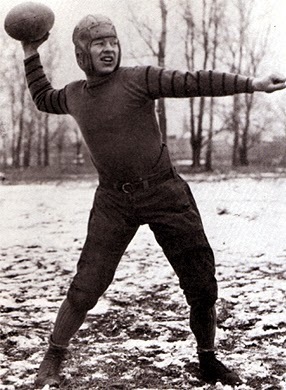 Curly Lambeau’s two touchdowns against the Triangles were his only ones of the season. Verne Lewellen went on to lead the team with five TDs and 30 points and Red Dunn contributed a touchdown and seven extra points.